18th century North America. After more than 20 years of conflict, the Thirteen Colonies and the British Crown are on the brink of all-out war. Battle lines are drawn. Bloodshed is inevitable. Out of the embers of his burning village, a new assassin will rise. Born of Mohawk and British descent, his fight for freedom and justice will be forged in the flames of revolution. Eliminate your foes with an expanded arsenal of weaponry including bows, pistols, the tomahawk, and the signature blade of the Assassin Order. Explore densely populated cities, situated along the vast wilderness of a dangerous frontier, abundant with wildlife. An all-new game engine delivers the brutality and the beauty of a nation caught in an epic war for independence. 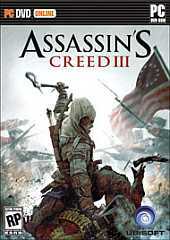 On March 29/2019, Assassin's Creed III: Remastered was released with improved mechanics which works in the 4K resolution and uses HDR technology. In addition, it has been enriched with all add-ons developed with the original in mind.